If you are using a CAQDAS package to analyse your data you need to check which file format it will accept. 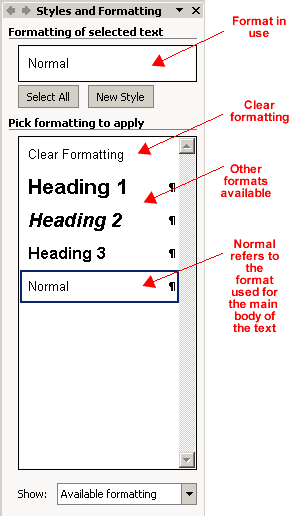 Details on how to save you file into a different format can be found at Saving text in another format. A box will open on the right called Styles and Formatting. See Figure 1. 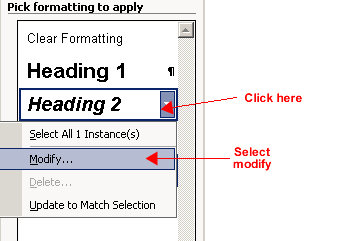 To apply a heading select the text you want click on the heading you want in the Pick formatting to apply box. 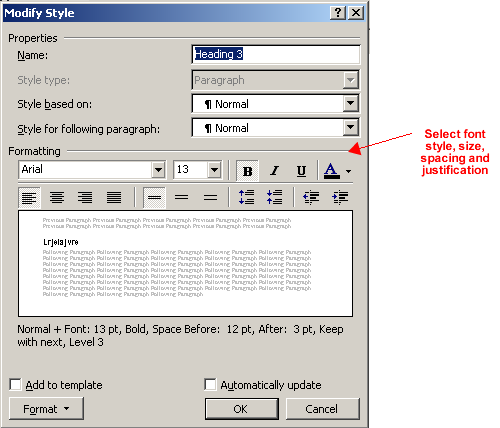 You can modify the heading styles to your own requirements. Move the mouse arrow over the heading you want to modify. click the pop down menu and click Modify. See Figure 2. The Modify Style window opens. Select the text style, size, spacing and alignment you require. See Figure 3.